Kodak Retina II (type 011). Photograph gallery. Throughout the monumental upheavals of the 20th century the work of the war photographers stands out as exceptional. 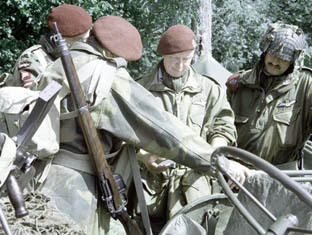 Here we have some airborne troops discussing their push through Normandy following the D-Day landings. Well of course not - it's a complete fabrication, as the Retina II was just a little too late in any case. However when these opportunities crop up I don't always the correct period camera in my bag. 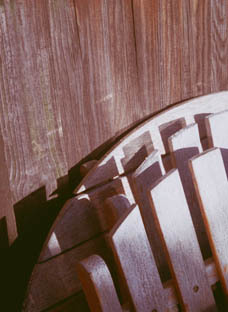 This image was taken on Kodak Gold stock, but then washed out to mimic the films available at the time. Spot on, date wise, this time. 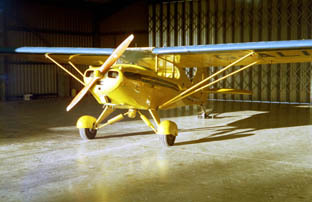 This PA17 Piper Vagabond was built in 1946. Possibly one of the most most active Vagabonds around, this example notches up 200+ hours a year and lives at Popham airstrip in Hampshire. I took this as I was captivated by the vibrancy of this little yellow aeroplane glowing in the late evening sun coming through the half open hangar doors. Sadly I have to report that the image, once processed and compressed for the web, is a shadow of it's former self. C'est la vie. The Retina II is very pleasant to use. Surprisingly so if you saw the state this example was in when it arrived in the collection . Halfway through the rebuild I was beginning to doubt whether or not the struts would ever be able to move again, they were so rusty. Perseverance has paid off however and the camera returned a near perfect 1st roll on its post restoration outings. The rangefinder proved accurate and the smooth shutter release helps to keep the camera still during slow hand held exposures - as here at 1/50th sec. 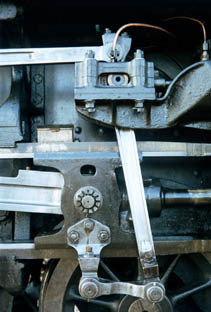 This is part of a steam locomotives mechanism. Far right, at the limits of the focus on the left. The Retina II is a perfectly usable camera for everyday use and as it folds down neatly, doesn't take much space in your bag.